Being an entrepreneur is by no means easy. Especially if the company values make running the company economically challenging. Every entrepreneur needs guts, persistence and strong vision on their everyday performance. Yet there is no way to guarantee that your business will be successful. In Finland we call this persistence, guts and determination "sisu". If you have sisu, you will be ready to fight for your dreams time after time, getting up again when you fall on your face. Finnish business journal Talouselämä wrote about the way this entrepreneur keeps herself ready for every day challenges. (Unfortunately the story is in Finnish). One of the most famous icebreakers in Finland is called Sisu. Sisu has been breaking the Baltic ice in all kinds of weather circumstances for over 40 years already and is still going strong! I think we Finns love our icebreakers for their beautiful symbolic value of being strong and not giving up. By the way, Helsinki is the only capital with icebreakers right in the center of the city! One of the most inspiring stories of the Finnish sisu is the story of Emilia Lahti, who is at the very moment running 50 ultramarathons in 50 days in New Zealand. Talk about sisu ♥ Good luck Emilia on the last days of your run! Personally I find my power to keep going by sleeping enough, eating healthy and keeping a happy, optimistic attitude on life in general and on the people I meet. I also want to step out of my comfort zone every morning. If you have done the most challenging thing right after you wake up, it is quite easy to continue doing smaller and bigger miracles during the day. 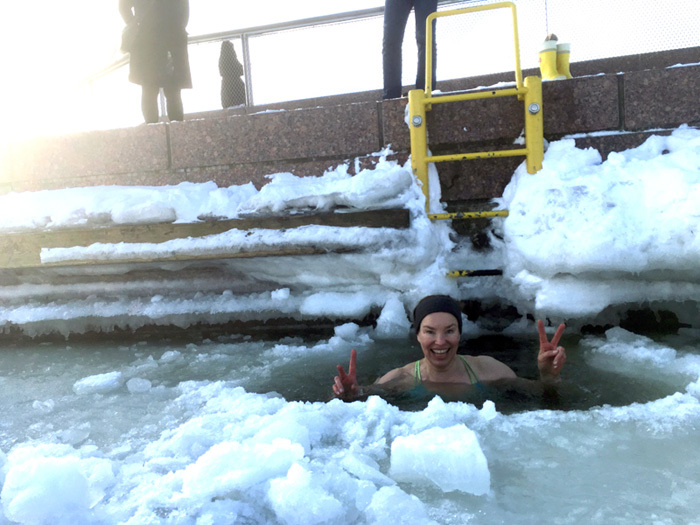 The freezing Baltic makes me very happy, but please check with your doctor before starting any extreme cold treatments, they can be dangerous if you have health issues. There is no dressing room or sauna at the Eira beach where me and a few of my friends swim every morning. So it is especially refreshing when the air temperature is -20 degrees Celsius and the wind blows 10 meters per second. The water temperature is below zero, but it feels warm compared to the wind. The cold water swimming reduces stress and releases endorphins. It certainly makes you energetic all through the day. Here you can find 10 reasons to embrace cold water swimming. 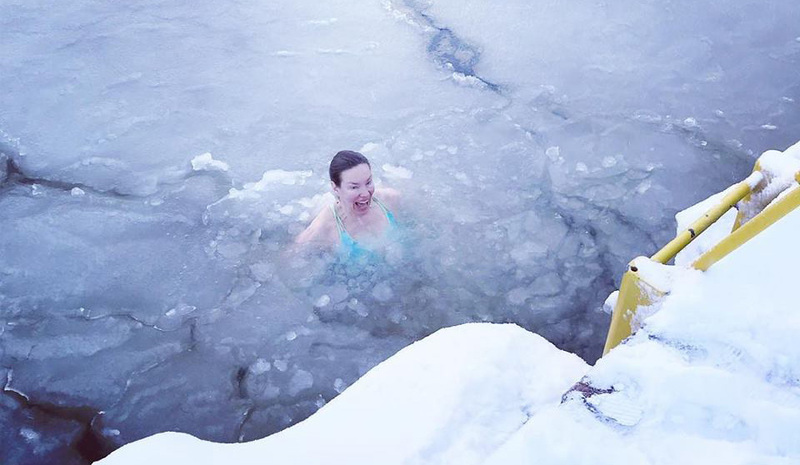 HAVE YOU TRIED COLD WATER SWIMMING, CRYOTHERAPY OR COLD SHOWERS TO BOOST UP YOUR DAY? I would love to hear about your experience, please share your story below! In May 2017, when Jane McDonald and her film crew (from Cruising with Jane McDonald) visited Taiga Colors, I told Jane that I intended to kiss Juuso the painting bear when I finally would get the chance to meet him. Well, I have news for you Jane! In the beginning of September I had a chance to take a few days off from work and fly up to Kuusamo. My good friend, journalist Päivi Arvonen, took good care of me and showed me around. The first day after Päivi picked me up from the airport, we went to Kuusamo Predator Center to meet Juuso and the other bears. In addition to myself, Juuso the bear is the only artist of Taiga Colors, and our mutual JuJu Collection was launched last May. We were happy to get Sulo Karjalainen, the founder of the Predator Center and the lifetime companion of Juuso and the other bears, as our host during this extraordinary visit. When Juuso saw him approaching he got on his back feet and started eagerly "dancing" back and forth, showing that he was all exited to meet us (or more likely Sulo and the grapes and plums we had with us). But before going to meet Juuso, we went to meet and feed the other bears first. Getting ready to feed Niisku. Pictures of Jutta and the bears by Päivi Arvonen. When we finally got to Juuso, he was very upset. It had taken us too long with the other bears and his feelings were hurt. Talk about a true artistic spirit! He turned his back on us, and didn't care about the treats we had brought him. It took Sulo quite a lot of effort and about twenty minutes to get him relented, but finally he came to meet us. "This is your bedroom, isn't it?" "Which one of these pictures shall we post on Instagram, Juuso?" "I have no idea why that woman is babbling like that..."
"...but I guess she is harmless..."
"She looks funny though...I bet she hasn't kissed a bear before...."
What an amazing experience! In Finnish language, the scouring pad is called karhunkieli, which means the tongue of a bear. I have to say that the word doesn't give you the right image at all. His kiss was soft and pleasant, and his breath was as fresh as the summer wind! I thought that I will never ever wash my face again. This meeting happened under the supervision of Sulo Karjalainen, who has raised Juuso and therefore knows him like his own child. If you meet a bear in the nature, please do not try to kiss it. Do not run or climb into a tree either, because bears are much faster runners and better climbers than you. Talk to the bear calmly so you will be identified as a human, and move away slowly keeping your eye on the bear. In Finland there are about 1800 bears in the wilderness, but the chances of meeting a bear are quite slim. They normally smell you way before you can see them, and they stay away in a distance. Observing you. Next day we went hiking at the most popular hiking route in Finland called Karhunkierros (the bear circuit). The full route is 82 km, but we did only the short version of it (12 km). I love swimming in natural waters, and of course I had to take a dip in the downstream of Jyrävä waterfalls. Jyrävä waterfalls at the background. A great way to get refreshed on the way. Picture by Päivi Arvonen. We also fed some Siberian jays. They are very tame, another wonderful experience in Kuusamo. For a photographer Helsinki is an amazingly beautiful and inspiring city. As a designer and a photographer, I tend to see everything around me either as pictures or patterns. The four seasons of the country offer different colors, moods and lights into images, and the urban views and industrial scenes might get more interesting from the ever changing weather. 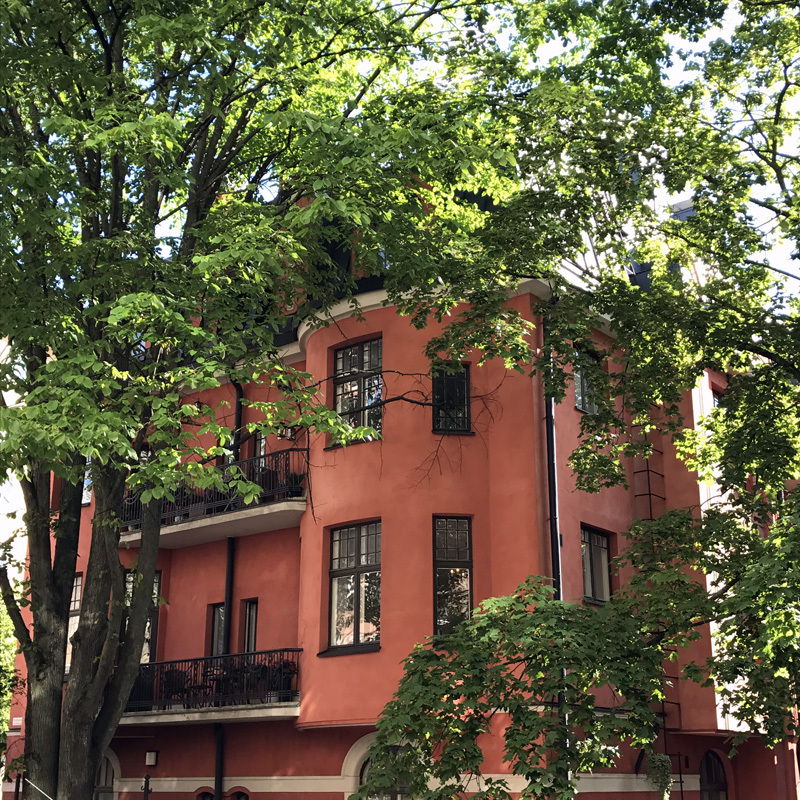 Helsinki has the largest concentration of Art Nouveau (Jugend) buildings in Northern Europe. 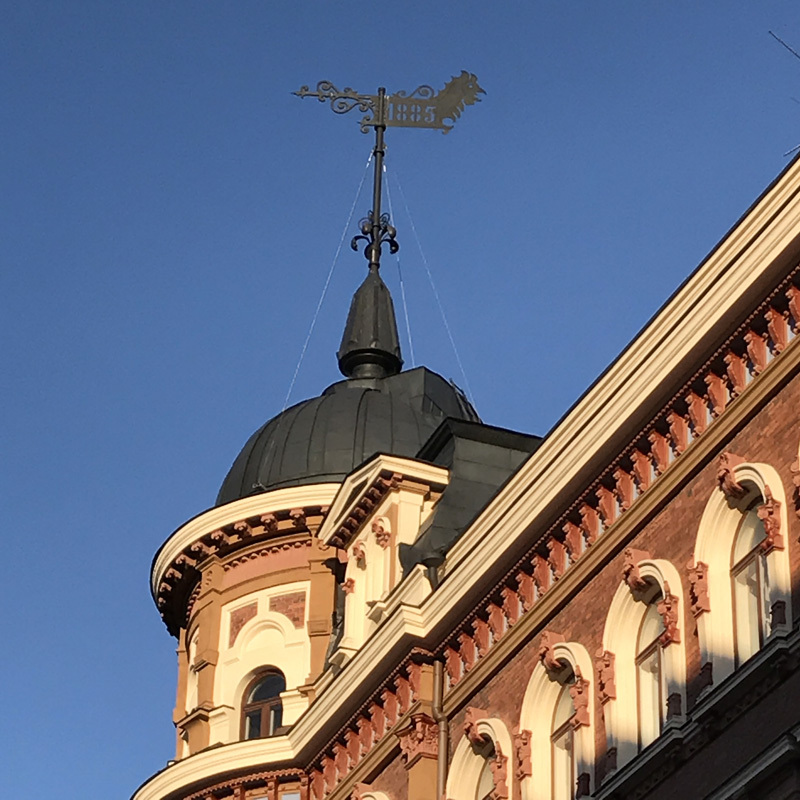 You can find the walking route Art Nouveau map here, and you might also like to visit the Museum of Architecture on Kasarmikatu 24. 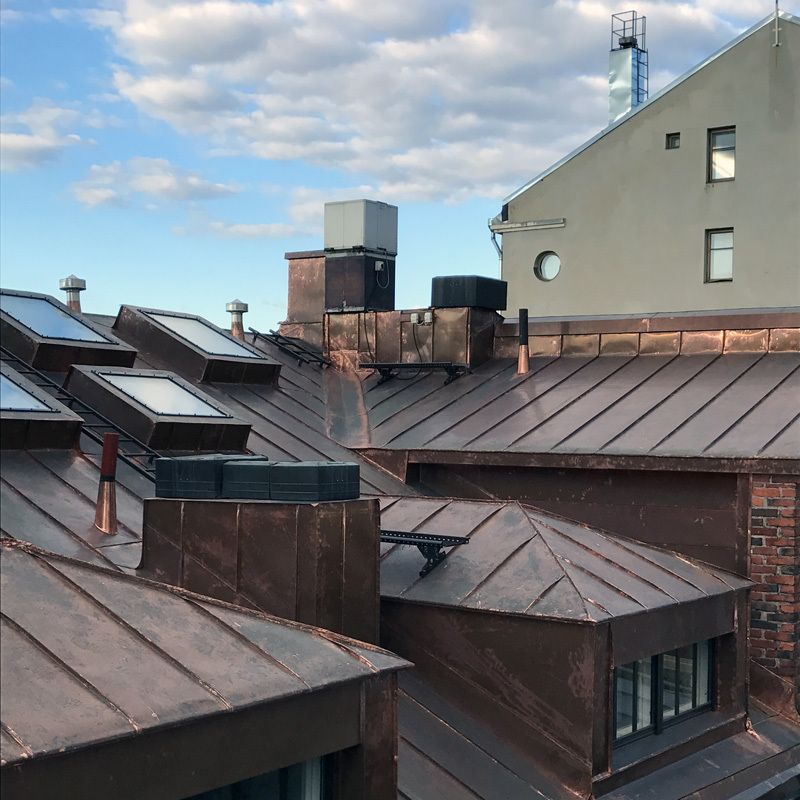 Here you can read more about the architecture in Helsinki. LÖYLY is internationally most well-known public sauna and restaurant complex in Helsinki. There you can treat yourself to a smoke sauna & a dip into the refreshing sea, or just enjoy a drink at the cozy terrace. The Finnish word for a bear, KARHU, indicates to the course (karhea) fur of the bear. Karhu ( Ursus arctos) has always been sacred to the Finns, the king of the forest and has played a significant role in Finnish mythology. Ancient Finns considered the bears to be our ancestors. Using the orginal word for the animal, ohto, was prohibited. Therefore there are over 300 different names for the bear in Finnish language and dialects; mesikämmen, otso and kontio just to mention a few of them. 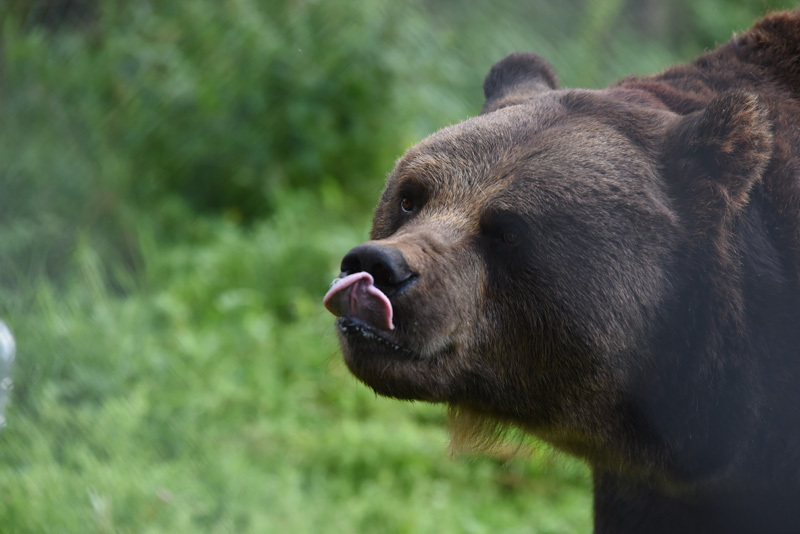 In Kuusamo Predator Center there are six bears, one of them is called Juuso. Juuso is the most famous bear in Finland, there are plenty of YouTube videos of Juuso and he has been featured even in the Huffington Post. As far as I know he is the only brown bear in the world, that paints. Juuso has been raised up by Sulo Karjalainen, who worked as an assistant for the Finnish Game and Fisheries Research Institute. Sulo took care of infirm and orphaned bear, lynx and other animal cubs found in wilderness. Some of the cubs were injured in car accidents or their mother had been shot. As the animals gained back their strength, they were released back to the wilderness. When the research program by Finnish Game and Fisheries Research Institute was ended, the animals faced dispatching. Several of the animals had lived in the house of Sulo Karjalainen, and he had formed a close relationship to many of them. Sulo applied for an authorization to keep predators and to establish a zoo, and Kuusamo Predator Center was established in 1992. Juuso's father, Vyöti, came with the police car from Suomussalmi as an orphan cub, and Tessu, Juuso's mother, was one of three orphaned siblins also found from Suomussalmi. 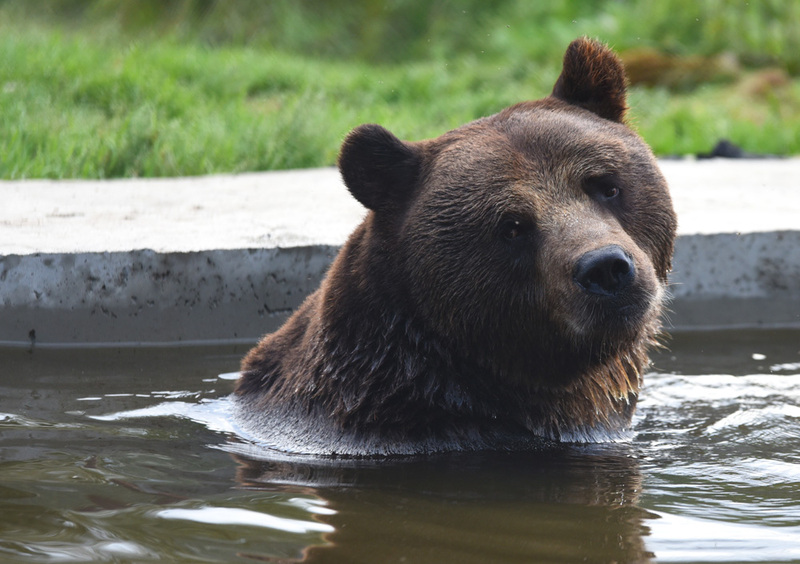 Juuso had his 18th birthday while hibernation during last winter. 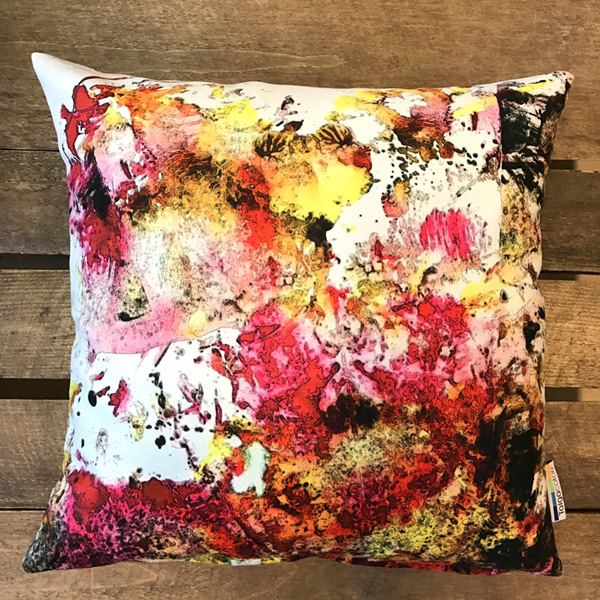 When animal art collector Heikki Lehtosaari contacted me with his idea of me designing a collection based on Juuso's paintings, at first I hesitated. And the designer's despair continued all through the design process. Why am I doing this? Will it be interesting enough? How will it blend with the rest of my work? But after the launch I realized, that the JuJu Collection was indeed worth designing and launching. Juuso uses a lot of colors, and so do I. I love telling stories to customers in my shop, and this is definitely a lovely and unique story. So now we have a new artist at Taiga Colors and I love it! Kuusamo Predator Center gets 10 % of the sales revenue of the JuJu Collection. All the JuJu Collection items, as well as all the other Taiga Colors products, are manufactured in Finland. Have you ever seen a bear? What is your opinion, can the art of a brown bear be called art? Ever since I was a little kid I was interested in flying. I loved jumping down from the roof of my grandparent's sauna, of course in a huge pile of snow. I built Apollo shuttle underneath the kitchen table, and spent hours there as an astronaut. When I grew up and started travelling, I always asked from the flight attendant to get me a permission to go visit the cockpit during the flight. I applied for flight attendant training, but I was too tall. In 2004, travelling by myself in Borneo, I got a chance to tandem skydive at 4000 meters from an old C-130 Hercules. My heart starts beating really hard when Hornets fly above. I still run outside if I hear a helicopter passing by. I love the take offs and landings when travelling. Aviation is written in my blood, and I have to find out where and why. So three years ago, when I found out that I would get to design a project for the Finnish Defence Forces, I was thrilled! One of the patterns I designed for the project was a wall paper of a F-18 Hornet. 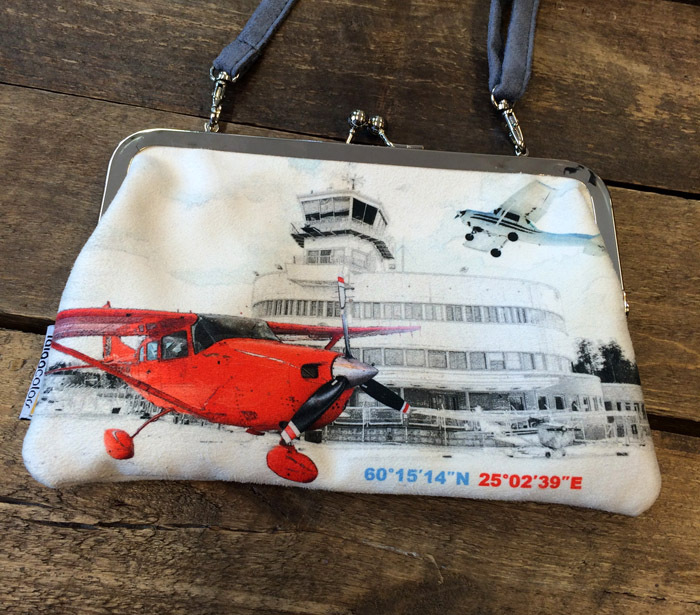 Soon customers started asking for Taiga Colors collection items with aviation patterns. So in December 2015 I started organizing contacts and photo permits to Helsinki-Malmi Airport. I wanted to design an airplane pattern to accompany the Taiga Colors icebreakers, cranes and urban Helsinki patterns. My interest at this point was purely visual. Then what happened? I found out about the alarming situation of the airport and turned into an Malmi Airport -activist in no time. And launched an aviation themed 60°15′14″N 025°02′39″E -collection with 25 different pieces, varying from cushion covers to evening clutches. So what is so special about Helsinki-Malmi Airport? Helsinki-Malmi Airport is probably the world's best preserved airport from the early days of passenger air traffic. The beautiful airport with its functionalism architecture buildings was built in 1936. It is the most important pilot training airport and the second busiest airport in whole Finland. It is a recreational area for locals, and has for 80 years been a free open biotope area with unique fauna and flora, with a number of threatened and near-threatened species. Europa Nostra and the European Investment Bank Institute selected Malmi Airport as one of Europe's Seven Most Endangered cultural heritage sites in 2016. The city of Helsinki is about to close the airport at the end of this year (2016) in order to make it a residential area. It is quite obvious that it is in the interest of only a small group of politicians and developers to close the airport. Anyone flying into Finland can see that there is no shortage of land in this country, even in the greater Helsinki area. By closing down Helsinki-Malmi Airport, the only international unscheduled airport in 150 km range, the city of Helsinki is not only destroying the future of aviation in Finland but also threatening democracy in Finland. All the polls have shown that the residents of Helsinki and Uusimaa province want to keep the airport, only 15 % are in favor of construction. Lex Malmi, the citizen's initiative to retain the airport in aviation, has been supported by over 55 000 people, and it will proceed to the Parliament during 2016. Live Long and Prosper, Malmi Airport!